Home | Practice Areas | Personal Injury | How Long Will My Case Take to Resolve? If you have suffered a serious injury in a car crash or have been involved in an accident where you will file a personal injury claim, the temptation is to settle as quickly as possible. This is especially true if the injury has left you unable to work and the bills are piling up. Instead of trying to guesstimate how long it will take you to receive your settlement after you file a personal injury claim, it is important to understand the process itself. It is not a matter of simply filing a claim and receiving a lump of money in settlement if you want to receive fair compensation. While it is true that relatively small claims can be settled quickly, these are by far the exception to the rule. The process of settling a personal injury claim can last anywhere from several months to two or three years pending upon many factors. Understanding those factors will show you why the process can sometimes take longer than you think it should. What Are the Steps Involved in Filing a Personal Injury Claim? Your personal injury claim may move through several steps before a settlement is reached or compensation awarded. The most important thing for you to do if you are injured in an accident is to seek medical treatment immediately. Not only is this the correct thing to do for your personal health, but it is also extremely important if you wish at some point to file a personal injury claim. Remember, it is incumbent on you to prove that you have been injured severely enough to be awarded compensation. Medical records play a key role for an insurance adjuster or even a judge or a jury to determine this. If you wait to receive medical treatment even for what you consider a minor injury, the insurance company’s lawyers will use this as a way to try to prove that your injuries were not severe enough to warrant compensation. Realistically, this should be your next step almost as soon as you leave the hospital or doctor’s office after you receive medical treatment. While it is true that you can settle a personal injury claim by yourself, this is not advisable. How do you determine if your injuries are minor? If any of the following conditions are met, you need to hire a lawyer. If you are off work for more than a few days. If you have suffered a broken bone. If your medical bills start to accumulate so that they are now in the thousands of dollars. Select a lawyer who has experience in both negotiating successful settlements for their clients and a successful track record in court if a personal injury lawsuit goes to trial. It is also important to choose a lawyer who has the financial means to absorb any costs if your personal injury claim lasts a long time. Do not work with any lawyer who says you have to pay upfront. The first thing your lawyer will do is sit down with you and go over the details about the accident, the medical treatment you have received, your current medical condition and also your personal background. It is important your lawyer understand every detail about how the accident occurred and the severity of your injury. You do not want your lawyer to be surprised during discovery or at a trial when the insurance company lawyer knows something about your condition that they do not know. The lawyer will then take steps to collect all your medical records and expenses connected to your injury. This can sometimes last several months. The majority of personal injury cases can be settled before a lawsuit is filed and the case goes to trial. After interviewing you and collecting your medical records, if your lawyer thinks your case can be settled, they will make a demand to the other party’s lawyer or insurance company. If your lawyer thinks the other side will hesitate to make a settlement, they will file a lawsuit. This is especially true if you have suffered a permanent injury or impairment. The process of making a demand or filing a lawsuit will not take place until you have reached a point of maximum medical improvement (MMI). MMI is a legal concept which means the doctor has determined that your health has recovered as much as it is going to recover. Your condition may still worsen but MMI is the point where your doctor determines you are not going to get any better. Your lawyer will wait until your doctor says you have reached MMI because they have no idea how much your personal injury claim may be worth until this point. A lawyer will not file a lawsuit before the MMI is determined because if the case goes to trial, a judge or a jury may undervalue the extent of your injuries and award you less compensation than you actually deserve. If negotiation fails to reach a settlement for your personal injury claim, your lawyer will file a lawsuit. It normally takes a personal injury case one to two years to get to trial. Remember a lawsuit must be filed within your state’s statutes of limitations. Statutes of limitation explain how long you have to file a personal injury claim after the accident. 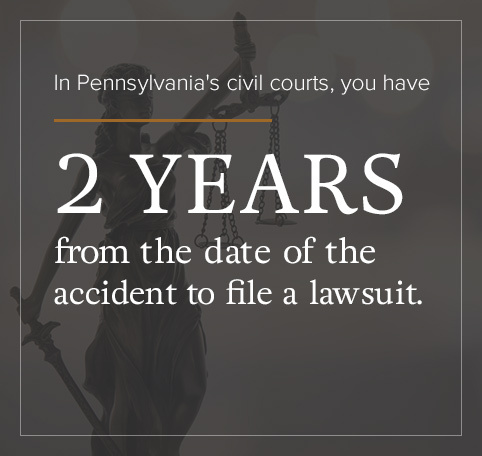 In Pennsylvania’s civil courts, you have two years from the date of the accident to file a lawsuit. However, if you are filing a personal injury lawsuit against a city, county or state agency, you only have six months to file a claim. Pennsylvania is a “no-fault state” when it comes to auto accidents. Normally when people sue after a car accident, they are not suing the other party or even the other party’s insurance company. They are suing their own insurance company to make them pay out 100 percent of what is covered in their policy. This is another reason to hire a good lawyer to represent you. This is when each side investigates legal claims and defenses. There are three forms of discovery: interrogatories or written discovery, document production and depositions. The other party’s lawyer or insurance company will send you an interrogatory, which means they will ask you some questions, and your lawyer will do the same of the defendant. They will also take depositions of any relevant witnesses — for instance, if someone observed the accident where you were hurt or family members or friends who can describe your pain and suffering. Remember, the idea behind the discovery process is to expose all facts that are relevant to the case. If you have hidden anything, or have not told the complete truth about your situation, it is very likely at some point in the discovery process this will be exposed. Be honest with your lawyer about the facts of the case. It’s very difficult for them to do their job if you keep them in the dark. Discovery can be an intrusive, frustrating and frequently expensive process. Before you file a lawsuit, you need to take into account how much you want your life open to the kind of scrutiny it might receive in discovery. Again, be honest. Lying during discovery and having that lie exposed is the fastest way to lose a case. Depending upon the complexity of the case in court deadlines, this phase can last from six months to a year. After discovery, your lawyer and the other party’s lawyer will again explore a possible settlement. They may also try mediation. 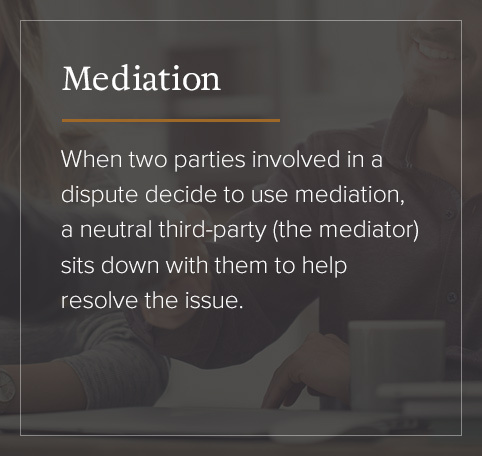 When two parties involved in a dispute decide to use mediation, a neutral third-party (the mediator) sits down with them to help resolve the issue. Mediators are trained to work towards a mutually satisfactory outcome to a personal injury lawsuit. It’s important to remember, however, that the process is entirely voluntary until your case becomes an actual lawsuit. Mediation has become a more popular option over the past few years. Dealing with personal injury cases can be expensive, time-consuming and stressful. Lawyers and insurance adjusters have come to recognize the value of mediation and are using it more often as a way to settle a case without going all the way to the final step and a trial. It can be very useful if negotiations between you and the insurance company have stalled. Mediation may be a helpful step before deciding whether or not to take the case to trial. If mediation or settlement talks fail, your personal injury lawsuit will go to trial. This trial may last anywhere from a day to two or three weeks depending upon the complexity of your case. Trial dates may also sometimes change depending upon the judge’s schedule. It is not uncommon for your trial to be canceled and moved to a different date. This is a normal part of the court’s proceedings. As you can see from the information above it can take anywhere from several months to two or three years before a personal injury case is settled. We understand that this may seem like a long time, particularly if you have been off work and are worried about money. The temptation in these situations is to settle quickly and get some cash. Insurance companies count on this happening. In fact, it is one of the reasons that they may hesitate to settle a legitimate claim. If they do not pay what you are legitimately entitled to at first, you may panic and accept a much smaller amount. But if you settle too soon, your decision can have serious consequences over your entire lifetime. You should avoid any lawyer or insurance adjuster who says they can get you a quick settlement. Here is an example case. Imagine you are in a car accident. You immediately go to the emergency room where you are treated for a neck injury but not admitted to the hospital. Over the next few days, the stiffness and soreness lessen, but they never go away. You are concerned that your neck is not improving and you hire a lawyer to start putting together a personal injury lawsuit. You see your primary physician, who prescribes physical therapy and recommends you take some time off work. Several months later, you feel a bit better, but your doctor is still concerned and refers you to an orthopedic surgeon. You have been off work this whole time. Your cash reserves are running low, and a quick settlement starts to look attractive. You want your lawyer to file the suit now. Your lawyer advises you not to rush into settlement and reminds you that you have not reached MMI. You agree to wait a little longer. And it is good you decide to wait, because your visit to the orthopedic surgeon reveals a ruptured disc that will require major spinal surgery. If you had settled early, you would have had to pay all the costs associated with the operation on your own. But because you were patient, your lawyer can add those medical costs to your lawsuit, and you will get a larger settlement. In the end, it is impossible to predict how long any case will take to settle. The best advice we can give is to be patient and avoid settling too soon. Make sure you wait until you have reached MMI before attempting any legitimate settlement. Your doctor will be able to advise us about your long-term medical prognosis. Waiting for your personal injury claim to be settled can be frustrating and confusing. We understand that temptation to settle as quickly as possible when the situation appears daunting. Our team of experienced and knowledgeable personal injury lawyers wants to make sure you receive the maximum amount of compensation and will help guide you through those frustrating times to make sure you get everything to which you are entitled. At KBG Injury Law, we do not see you as just another personal injury case number. We see you as a person who needs our help to get what you deserve. Our goal is to give you individual attention and consideration. We understand how a wrongly denied insurance claim can affect you emotionally and financially, and how important it is for you and your family to be able to resolve all issues as quickly as possible. We invite you to take a free consultation where we can talk about your situation and determine if there are ways that we can help you. You can reach us 24 hours a day at our toll-free line 1-800-509-1011. Or you can request a free consultation, and one of our talented team of lawyers will get back to you as soon as possible.